What a happy little blue-bird - yes! you can count me in for a pot of tea ,that sounds real dapper - the bird variety bikkies will do just fine. Uh, did you say MACARONS? Actually your oatmeal and raisin bikkies sound wonderful and I love the happy bird! Such a sweet drawing! 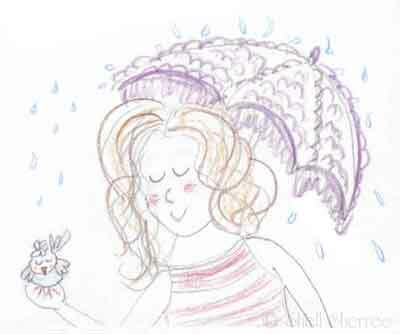 Easy to be happy in the rain with a cute stripey shirt and girly umbrella. And a friendly bluebird of happiness. I'll be right over for tea (milk no sugar) and a few of those brown-sugar oatmeal delights! I'll join you with the oatmeal and raisin biscuits. Just to be contrary, we had blue skies and sunshine today. I think my mother must have brought the Sunny Coast weather with her! Yesterday, I saw tiny birds using the leaves on a tree as bathtubs. Your bluebird is a charmer. So is your rain. Pass the bikkies, please. I just made my worst pot of coffee ever (which is saying something), so I will take some tea instead. puddinglane ~ you're in! And did I mention the linen napkins? Katie ~ I considered a trench coat, but I'm a bit 'over' the winter wardrobe at the moment! MmeB ~ could you tell your mum we'd like it back, please? :) Just kidding ~ the garden is loving it! It's gray & drizzlin only means 1 thing: time for some colourful ShSh & Macarons. Love your little bluebird! Tough choice between bikkies (which my very Southern great-grandmother made from scratch every single day and kept warming on the back of her coal (yes, coal) stove and lovely, colorful emergency macarons (which take me right back to Paris). Oh-la-la—what a dilemma! After a day of numbers and freeways I'm up for a fanciful pot of tea. And bikkies! I want to hear Hiker say "bikkies." I like the way this little bluebird thinks. Since we don't get much rain, it usually doesn't bother me to be out in it. With such a charming parasol even I wouldn't mind a little rain! Always glad to be of service, dear Cafe. Petrea ~ heh, let me know how you go with that. Cali ~ a fluffy purple parasol could inspire all manner of wonderful things. Thank you, Favourite Vintage Finds. That's a lovely thought!! We had stormy, rainy weather today -- your wonderful drawing fits beautifully! Oatmeal w/ honey and cinnamon; a treat I love on a cool, rainy day. Ms M ~ what excellent timing! Mmm, oatmeal with honey and cinnamon is both healthy AND comforting.